Supernatural has featured fairies, creepy clowns, unicorns, and now imaginary friends. Just when you thought it couldn't get any more emotional, you meet Sam's imaginary friend Sully who inspired him to go to school and (try to) become a lawyer. Supernatural is a television show with mature content, and though this was a milder episode, I still caught a few trigger subjects. Warnings: Death of friends, depressing childhood, and death of a sibling. I thought at first that the little girl was being a brat to her parents, but if Sparkles was my imaginary friend, I wouldn't want to leave either! Sparkles was adorable and so happy. I couldn't imagine coming back into my room to see my best (imaginary) friend was dead. Sad as it was, his blood was really rad looking. Sam got a haircut (yes, I noticed). Also, I found it hilarious that he wished for marshmallow nachos as a child. I was surprised that Dean didn't indulge in the sweets Sully (Sam's imaginary friend) brought to use as a bribe to help him find out who was killing the other Zanna. I believe that this episode really struck home with me because of how supportive and inspirational Sully was with Sam. I wish we weren't so susceptible to losing the open mind we have as children, but episodes like this help us to rekindle that side of us (if you take messages from the show as I do). Please keep flailing that robe around. It makes you look like a Jedi Knight! 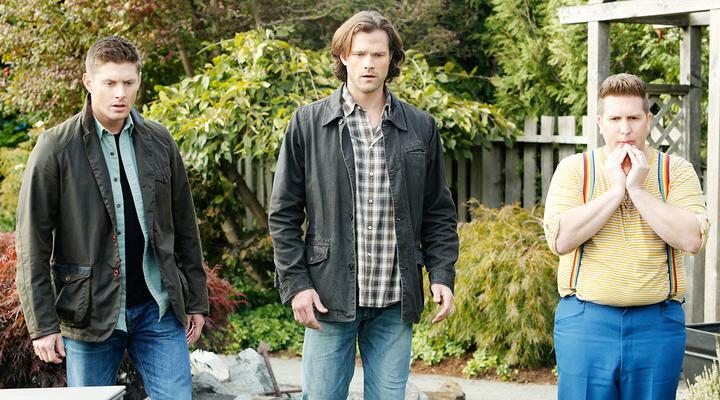 Sam and Dean as grief counselors...yes! The sweaters alone made me happy. When the mom was unknowingly smearing Sparkles' blood on her face, I felt mixed emotions of laughter and defeat. I feel defeat is the best word for the situation because it takes it back to what I mentioned about losing our open minds. I noticed that Dean has a habit of putting his foot in his mouth when in situations he can't wrap his head around. "A family that showers together..." Dean, what were you even thinking when that sentence started to form? I think Weems could have totally been Dean's imaginary friend as a child if his "childhood" would have been different. He kind of reminded me of Ash (mostly the mullet). The killer being a child that was once a friend of Sully was another thing I enjoyed with this episode. It wasn't a monster, it wasn't the Darkness, it was a human that was driven by her pain to contact evil forces to help her get revenge. The witch who helped her? I believe it was Rowena. I started to touch on this earlier, but I feel that one of my favorite scenes from the episode was when Sully and Sam were hanging off of the bed and Sully mentioned to Sam that he could run away and go to school to become a lawyer if he wanted to. I like that the writers pulled this story line from the beginning of the series and brought it back to this moment. It makes sense that a dream like this came from the only support Sam took note of as a child (factor in that he was unaware of all that Dean did for him until he was old enough to understand). A boy raised on hunting would have no reason to go off and work for the government that chases them down for credit card fraud and false identities. That is why I loved this story arc. For those of you that haven't watched the mid-season finale promo...DO IT!!! For those that have, LUCI!!! Only fans of this show can say that they're excited for Lucifer's return, haha! This next episode looks like it's going to be incredible. Did you have an imaginary friend as a child? I did! Let's chat about it and this episode in the comments.